This post is for Anglophone Canadians who are seeking ways to speak more French in Anglophone regions in Canada. For those of you who are learning French, or who are trying to integrate a bit more of our country’s Francophone culture into your own life, this post might help to offer new avenues to expand your horizons, meet people and improve your French speaking and listening skills. To give you a bit of context, I’ll tell you a bit about how this fits into my own background. Owing to decisions my parents took when I was still an infant, I was chosen to be one of the first “guinea-pigs” for the new “early-development immersion programs” in Western Canada. When I was 3 years old, I was placed in the early pre-school immersion experiment. Since then, my life has been a fairly even split between French and English: Friends, school, work, and many other aspects of life. Because of this, I have always considered myself both Francophone and Anglophone. During my younger years, school (and school friends/peers) were key to this duality – regardless if I was living in British Columbia or Alberta. Later in life, my Francophone university, friendships, Francophone communities in which I lived (in Western Canada, Eastern Canada, and also abroad) all played into this duality. Over the course of years, I held numerous occupations which were sometimes 80% or more in French. It can be easier to have French interactions in certain Canadian Anglophone cities versus others. Some cities have “Francophone districts” – complete with Francophone stores, social activities, universities and services. Edmonton (Alberta) has a Francophone district, Bonnie Doon. Winnipeg has St. Boniface. Moncton’s downtown core is very bilingual (and Dieppe is a French-dominant district). And of course, Ottawa-Gatineau has numerous French-dominant regions and is quite bilingual in and of itself. However, most other Anglophone cities across Canada do not have a prima facie Francophone districts or quarters. I left Canada for a number of years for work. But when I returned to Canada, I moved to the very Anglophone city of Toronto. Toronto is the first major Canadian city I have ever lived in with does not have a Francophone quarter, district, or a district with a French-only University. This has presented me with a new challenge: How to meet others in French. This is the first time I have ever had this explicit challenge. In the year and a half that I have lived in Toronto, I think I have encountered many of the “language challenges” which other people across Anglophone Canada regularly encounter when they seek to incorporate more French into their own lives. The high-density, urbanized region named the Golden Horseshoe (the region around Toronto) has over 10 million people — which makes is the third largest urban agglomeration north of Mexico (it recently overtook Chicago, and is now third behind New York and Los Angeles). According to statistics Canada (2011), this region has over 100,000 Francophones who have French as their first language. This gives the Golden Horseshoe region the third largest Francophone population outside Québec (behind Acadia, and Ontario as a whole). Again, according to statistics Canada (2011), there are 541,271 bilingual people who speak both French and English in the Golden Horseshoe. This makes the region the second largest bilingual region in Canada, outside of Montréal. However, unlike Montréal (in which most linguistic minorities and bilingual speakers are centred around the downtown core) those who speak French in the Toronto-Hamilton Golden Horseshoe region tend to be evenly spread over a vast urban region which takes over two hours to drive across at full freeway speed (at 120 kms/hour – from Bowmanville in the East to St-Catherines in the South). This makes it challenging to meet people who also speak French when French speakers are evenly spread over such a large urban region. 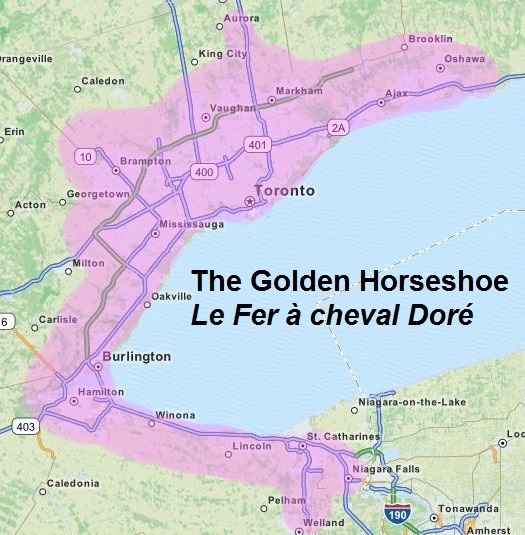 Toronto and the Golden Horseshoe do not have a “French District”, per se. Granted, I hear more French being spoken in downtown Toronto than other regions, but it is not enough to say that the downtown core is “French”. The real challenge arises when there is no way to know whether or not the person you pass in the street, or the store you pass on the sidewalk speaks French. Similar situations exist in other English-dominant cities across Canada such as Vancouver, Calgary, Saskatoon, St. John’s and Halifax. I found a great “solution” with which to meet others who speak French, and thus evening out one’s social life in Anglophone Canadian cities. I can tell you that this little trick has surpassed anything I could have expected. If you live in an Anglophone dominant city in Canada, you too may be very interested in this. Quite by accident, I came across an online listing of French, Francophone and Francophile “Meet-ups” in the Greater Toronto area. These “meet-ups” are generally socializing groups – sometimes in cafés, sometimes in bars, and other times in restaurants. They are basically random social “drop-ins” in which everyone and anyone is welcome. The common language is French. It is an opportunity to meet new people from all walks of life, share a beer, share a meal, and make new friends. How good of an “in” are these meet-ups? I was completely caught off guard when I came across these meet-ups. I was even more caught off guard when I saw them with my own eyes. There are so many “meet-ups”; one every two to three days in Toronto alone. They are spread throughout the whole Greater Toronto Area (GTA). Three of the meet-ups regularly take place within a 10 minute drive of where I live, and one within a 10 minute walk. There are so many in fact, that it would be rare that anyone in the GTA would be far from at least one of them. 37 separate French meet-up groups across the GTA with approximately 8700 membres registered online. Organizers tell me they estimate that the real number of “attendees” (those who come to the meet-ups, but who have not registered online to receive emails) is three times this amount, or 30,000 attendees. 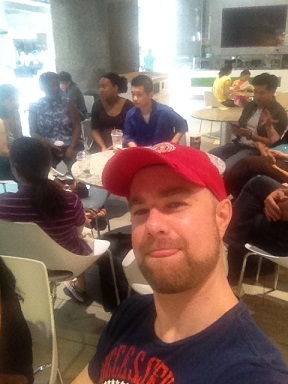 Out of curiosity, over a month ago I attended one meetup in Markham (in the Northeast of the Golden Horseshoe). It was held at a restaurant. Some people ordered food. Others ordered drinks. There were 15 other people. Perhaps half were originally from Québec, but who have lived in Toronto for more than 10 to 20 years. The other half were a mix (Franco-Ontarians, Acadians, and Anglophones who speak French). I have since kept in contact with a couple of people from that meet-up. A week later I attended another meet-up in a restaurant in North York (physically located in the middle of the Greater Toronto Area). Almost 40 people attended. This one was more than a pleasant surprise. Over half of the attendees were French-English bilingual first-generation immigrants… mostly Chinese, Indian, some East-Europeans, and some Iranians. These are not Francophone countries – but yet these people were fully embracing Canada’s bilingual nature. It was great! The other attendees were a mix of bilingual Anglophones, Francophones from elsewhere in Canada, and from other Francophone countries (France, Belgium, Switzerland, Mauritius, and Africa). In the subsequent two weeks, I attended two additional events downtown, one in a pub, the other in the bar of a well-known hotel. One event had around 90 people (mostly Francophones from Ontario, Québec and other Francophone countries – as well as a good number of fully bilingual Anglophones and first-generation immigrants). 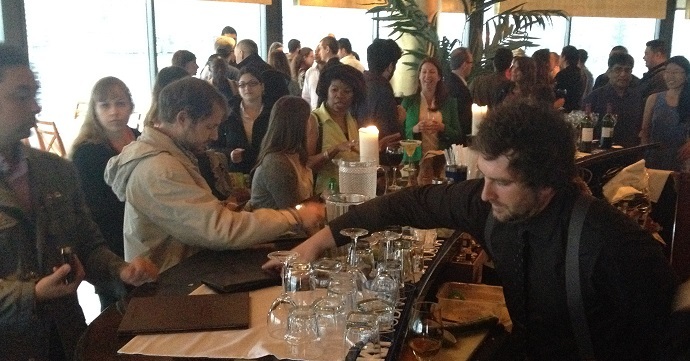 Another event had over 170 people – with much of the same mix as the last event. 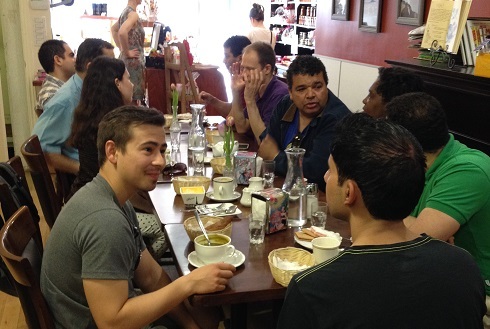 Last week, I attended a meet-up brunch in a restaurant, and met more people. We were a good mix: Franco-Ontarians, Anglophones, Francophones from Québec, from France, and first-generation immigrants. One word: unbelievable (I’m still shaking my head in semi-disbelief). I only set out to perhaps meet a couple of people with whom to have a beer with from time to time (I value a bit of a French/English balance in my life). I exchanged phone numbers and emails with just a few people. A tentative offer from someone as a potential travel buddy to check out Gaspésie and Acadia this summer. 5 weeks, four meet-ups, and… well… holy crap!! The website where I found these meet-ups is http://www.meetup.com/fr/. It will give you a list of many different French meet-up groups. Calgary, Alberta: 2 large meet-up groups, 1378 members. Halifax, Nova Scotia: 1 large meet-up group, 593 members. That’s almost 10,000 registered members in just these four cities alone — more than enough of an opportunity to meet others who speak French, and improve your language skills. (If the groups have more than 3 times the amount of unregistered members, like in Toronto, the numbers could very well be over 30,000 in these four cities as well). It boggles my mind that a chunk of people in the sovereignist camp continue to say that French is dead outside of Québec. On the contrary… I think with the advent of the internet and all the connections which can be forged, the net has basically become a “virtual French city”. Things are taking off like we have never ever seen in the history of the country. These sorts of opportunities to meet people, socialize and live in French have never been as easy to find as they are now. I would even dare to say that this new meet-up movement is more effective and more efficient than traditional French communities were. I say this in the sense that all of these people are out to meet others in a safe, public group environment – in cafés, restaurants and bars. At least you can target your efforts for immediate results. Combined with the massive French Immersion movement (a good number of fully bilingual Anglophones I met at the meet-ups were products of the Immersion program), and what seemingly appears to be a good deal of interest on the part of first-generation immigrants towards Canada’s French fact… I would say things are looking pretty good as to the overall direction of things, and the interest in Canada’s French fact. Wouldn’t you? Anyway… I’ve been invited out for supper tonight with a small group of people I met at one of the meet-ups. So I have to run! I went to the Mississauga Meet-up out of curiosity the other evening, and I found it to be one of the more interesting (and most “mixed”) groups. Although it only had about 30 – 40 attendees, people were from everywhere in Canada (des Franco-Manitobains, une personne d’Abitibi, Franco-Ontariens, Acadiens, de gens de Québec et de Montréal, un Franco-colombien, une Fransaskoise, des Francophones d’origine de Toronto, Anglophones who are very fluent in French, Anglophones who want to improve their French, business people, government workers, white collar, blue collar, a good mix of women and men… a very nice and diverse mix – all with beer, wine, jokes, interesting conversations and a lot of laughs!!). It has been a few weeks since I started to go to the meet-ups… and ironically, I now am thinking I have to make an effort to make “Anglophone” friends to do things in English. Considering all the people I have met through the meet-ups, and the social activities which have stemmed from it (camping, movies, boating, fishing, restaurants, day-trips & travelling – all in French, etc), it seems like my social life in and around Toronto is now more in French than English. Perhaps I should look for English meet-up groups now to re-balance! Hahaha!!! By Quebec Culture Blog 101 in Language and Language related on May 19, 2015 .